Vitamin C has been known to be one of the most powerful age fighters out there. St.Botanica Vitamin C Serum with Hyaluronic Acid uses the free-radical battler along with anti-inflammatory champ hyaluronic acid, a major component of skin, where it repairs the damage done by too much sun. This serum is further enhanced with Vitamin E, whose famous antioxidant powers also aid in nourishing skin repair. Science has shown that using skincare products containing both Vitamin E and C is more effective in protecting your skin from the sun's harmful rays than those that contain only one of the two. Gotu kola, from the wetlands of Asia, a star in reducing lines, wrinkles and dark spots. Blend in aloe extract to sooth and moisturize, jojoba oil (rich in natural fats similar to skin's own and known to as a great acne fighter), toning and firming ally green tea extract, and the tightening power of tannin-rich wild geranium oil - and you've got a fabulous team of natural skin experts working for you each time you apply the serum. 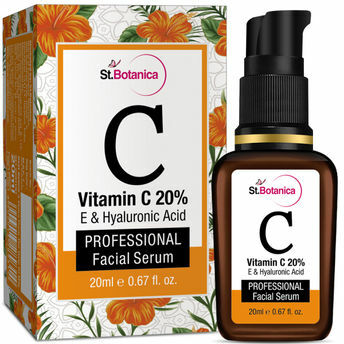 St.Botanica Vitamin C Serum with Hyaluronic Acid absorbs fast and is skincare's best step after toning. You'll quickly see more hydrated, brighter skin with more even skin tone. Your skin looks and feels restored and rejuvenated. Gentle and pure, our Vitamin C Serum with Hyaluronic Acid won't irritate or cause redness. It's a natural antioxidant super-blast in a bottle!